The Air Max technology takes Nike's old standard Air Technology and adds extra impact cushioning. This is Nike's attempt to counteract the "brutal, repetitive, downward force of sport." 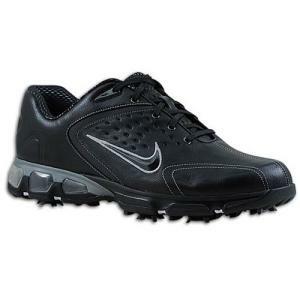 The Air Max is specifically designed to handle these impacts and provide protection. The Rejuvenate has Nike's Power Platform. This power channel helps give your golf swing power by freeing up your feet for optimum balance and a smooth weight transfer. The shoe has a full-grain leather upper which is extremely comfortable and gives you a snug fit. The Poron sock liner conforms to the contours of your foot, and the Champ Stinger Spikes give the shoe a great grip. The best thing about the shoe is that it is 100% waterproof. The shoe is designed to keep your feet dry even in the worst conditions. What's more is, this shoe comes with a 2-year waterproof warranty. One thing I would caution you with buying any Air Max: Always make sure to check the air pockets are intact and not deflated. It is not common that they are ruptured, but certainly something to be aware of. I would recommend this shoe to all golfers. It is a durable, sporty-looking, waterproof shoe.